Yiguang Ju received his bachelor degree in Engineering Thermophysics from Tsinghua University in 1986, and his PhD degree in Mechanical and Aerospace Engineering from Tohoku University in 1994. He was appointed as an Assistant and Associate Professor at Tohoku University in 1995 and 1998, and as a Changjiang Professor and the Director of Thermophysics Institute at Tsinghua University in 2000. He joined Princeton University in 2001. In July 2013, he became the Robert Porter Patterson Professor in Mechanical and Aerospace Engineering and serves as the Director of Sustainable Energy Program. 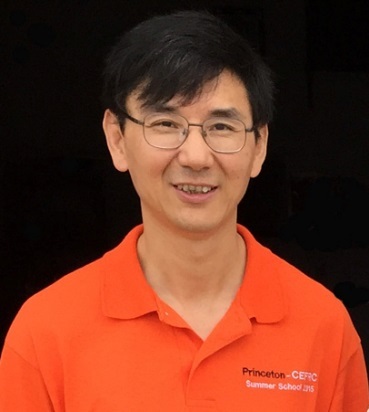 Prof. Ju’s research interests include energy, combustion, and propulsion in the areas of near limit combustion, microscale combustion, plasma assisted propulsion, alternative fuels, chemical kinetics, multiscale modeling, and functional nano-materials. He has published more than 170 refereed journal articles. He is an ASME Fellow and an associate editor for AIAA Journal, Proceedings of Combustion Institute, and Frontiers in Energy. He has received a number of awards including the Distinguished Paper Award from the International Symposium on Combustion (2011, 2015), the NASA Director’s Certificate of Appreciation award (2011), the Friedrich Wilhelm Bessel Research Award by the Alexander von Humboldt Foundation (2011).